Have you met the squirrels of the Mildred E. Mathias Botanical Garden? If you’ve visited the hillside grounds, which sit on the southeastern flank of UCLA, you already know these aren’t ordinary squirrels. They’re unusually large and sleek and display a remarkable commando-style bravado when menacing people for handouts. 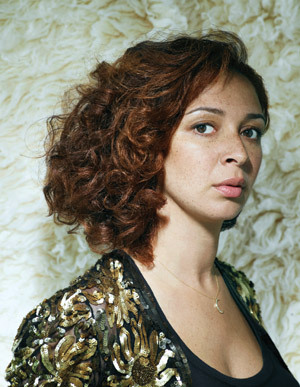 Maya Rudolph grew up next door to the garden. She liked how wild it was, loved getting lost in it, and today she has returned there for the first time since spending eight seasons on Saturday Night Live, where she became famous for caricatures like a big-as-life Oprah Winfrey, a larger-than-life Beyoncé Knowles, and a supersize Donatella Versace. On adjacent Hilgard Avenue, bus traffic streams by, but along the garden’s winding pathways, amid tracts of bamboo and clumps of wet fern, everything is cool and quiet. Somewhere North America’s tallest dawn redwood hides in the morning fog, when out of the blue Rudolph finds herself accosted on two fronts by the Mathias squirrels. Rudolph sidesteps and finds a bench beneath a shedding eucalyptus. She has big brown eyes and a tiny frame that work magic on men, and she is wearing a baggy sweater that nearly swallows her whole, with her hair pulled back in a scrunchie, where it opens into a frizzy blossom. She is the daughter of the music producer Richard Rudolph and the soul singer Minnie Riperton, who died of breast cancer two weeks before Maya’s seventh birthday. The couple had met in Chicago but left after facing eviction from their apartment, taking a drawn-out road trip in search of warmer weather and the right place to raise a biracial family. They stopped in Gainesville, Florida, in 1972, where Maya was born, and then moved to Laurel Canyon to reengage their music careers before settling in Westwood. “This was my stomping ground,” says Rudolph, gazing onto a wooded ravine. “It all seemed vast, and then there was the W nearby, which was called the Westwood Marquis, and it was very fancy. They had an elevator that only went up one floor, and I’d ride it up and down as a kid thinking, ‘This is the life!’” Suddenly Rudolph freezes. “Don’t move,” she whispers. “This one looks rabid.” Rudolph lunges at the squirrel, shouting, “Get out of here!” and then sits back in astonishment. Three years ago Rudolph had a daughter, Pearl, with her partner, Paul Thomas Anderson, the director of There Will Be Blood, Boogie Nights, and Magnolia—the last about a collection of mostly miserable people living in the San Fernando Valley who in various ways seem linked by fate. The story of how Rudolph ended up in her new movie, Away We Go, would easily fit into Magnolia’s plot. The film, which is cowritten by the novelist Dave Eggers and his wife, Vendela Vida, follows Burt and Verona, a mixed-race couple on a cross-country trip in search of a place to raise their expected child. Rudolph had small roles in films before Away We Go. She played an office assistant in Mike White’s Chuck & Buck and was cast as a harried stage manager in Robert Altman’s final film, A Prairie Home Companion. Altman had become very sick before shooting could begin and was told by the studio that his film could not be insured unless he found a backup director to continue filming should he become incapacitated.